Help me restyle my bedroom! We didn’t put a lot of effort into styling our bedroom when we moved into our rental place...nine years ago. It’s time. But I don’t have a decorator’s bone in my body, and I’m working with a tight space. Help? Here’s a view from the bedroom door. The weird gray stripes on the wall are where the studs? are showing through? I have no idea, but it’s ugly and I want to cover it up by making that wall an accent wall in some way. We rent, but we are allowed to paint or decorate how we want, within reason. Here’s a view from the diagonal opposite corner, looking towards the door. Here’s a panoramic of the whole room. The only things that have to stay are the bed, painting and the dressing table. What would you suggest for the accent wall—solid color paint (what color?) or wallpaper print? I found some peel n stick wallpapers that look kind of fun. What print might be a nice background to set off the painting? My husband loves, and I like, exposed brick, so I was thinking this could be interesting. I’m looking to change out the bedspread and possibly the curtains. I like the color of the curtains, but they clash with the painting. I’d describe the style I’m looking for as unfussy and comfortable, rather than sleek, super modern or avant garde. I’m happy to hear any suggestions or ways to think about this project. Take the color scheme from the painting: pale blue, pale red. Paint the whole room in pale blue (I think it's too small to have an accent wall); don't forget to paint the closet doors. Change the curtains out to a pale red; shorten them to just brush the top of that heater (? is that what that white thing is?). That'll give you the space between the heater and the door for a small shelf unit to put some of the knick-knacks on. Take the artwork/photos over the dressing table and fasten them to the closet doors, topped out so they're neat; smaller ones at the end doors, bigger ones in the middle. Put wall-sconce lamps over each side of the bed so they're level and also free up side-table space. You can also put sconces on either side of the dressing table. Hope this sounds good to you. I like MovableBookLady's ideas and I'd probably add a rug/s in the peach shade from the painting either as mats on either side of the bed, or as a large rug that extends beyond the bed. And maybe suspend some shelves from the wall under sconces so you can do away with the bedside tables. Less furniture on the floor will make the room seem more spacious. Regardless of whether you paint or paper the wall, I’d suggest creating some kind of headboard to frame the bed and give it presence. I’ve done various headboards that are neither boards nor attached to the bed frame - lots of possibilities! Then add some pillows in cases that match the duvet you choose, even if they aren’t what you sleep on. I’m not a fan of lots of throw pillows, but big, head-of-the-bed ones will pull the look together. I’d put the photos and art on the opposite wall in coordinating frames, and I’d have these be much bigger and space-filling. Maybe like like these from Crate & Barrel. Definitely change out the bedspread if you were going to do that anyway, and then put some different art over the bed, and get some curtains that go with the new art & bedspread. As someone who puts a lot of effort into decorating and gets a lot of compliments, my advice would be to change out the picture over the bed for one that isn't of your children (or any children) if the bed is the place where marital relations occur. That's an amazing portrait for a living room or even guestroom but not appropriate for a master bedroom. I think the stripes might be from the seams of wallpaper that has been removed. I imagine they're paintable. By the way, that must be the smallest version of that Robert Doisneau photo ever produced. First, a headboard and matching nightstands. It looks like the nightstands wouldn't be able to be too wide, from both the un-corner thing and the doors on the other side. Do some measurements, figure out what size nightstands, then choose a headboard to match (you don't necessarily need a footboard). For what it's worth, wicker (or similar) would be period-compatible with the vanity, and you already have a hamper that would match. Get corded sconces to replace the bedlamps, which will clear some space on the nightstands. The current ones look like they have large bases. You could also get lamps with flat-topped bases so you can put your stuff on them and be able to make use of some of the space it takes up. I don't think it would be a good idea to key the whole room off the painting, red white blue and peach doesn't give you a whole lot of options. Better to maybe even hide the painting and decide without it, then simply put it back up when you're done. You can get bedding that connects visually to it later on if you want, but art is not necessarily supposed to match anything around it. Gold curtains (not the shiny kind), and get short ones this time. I'm going to suggest Roman shades for the window. They have a low profile and won't overwhelm a small space, but look much nicer than miniblinds or such. I also agree that the painting belongs in the family room. (Sorry! ) I've never seen faux brick wall paper that didn't look tacky, but another pattern in a bold print might look nice as an accent on that wall to 'frame' the bed. Then instead of a headboard you could get a couple of large square pillows in a solid color that pops against the wallpaper. I also like the idea of wall lamps (corded sconces). 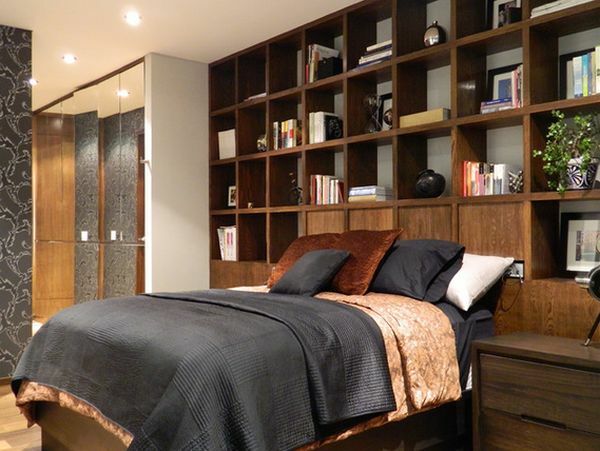 You could even replace the nightstands with a set of matching wall mounted shelves. Yes to the above. I bought half-round shelves from Ikea and mounted them on either side of my bed in place of nightstands. When you have a small bedroom like I do, maximizing clear space on the floor makes a surprising difference. Bedrooms should be a place for relaxation and harmony. I would aim for symmetry, good lighting, and storage (reducing clutter leads to more harmonious space). I would suggest first organizing and making space for everything you don't need everyday to go more neatly into the closet(s?) or in dressers/storage unit. Might be worth assembling a pinterest board of bedroom styles you like but I don't think the faux brick makes sense. That would work in a raw contemporary space, but if you want comfortable and unfussy. stick with something simpler. - Move the hamper away from the bed and window. - Yes paint the walls - probably easiest to choose one single neutral color scheme. To simplify. find a bedding set in your current curtain colors as the focal point and keep the paint on the walls (and curtains) a neutral taupe. - Get roman shades so the curtains aren't uneven with the heating unit. - Agree that you should replace the portrait above the bed with another one. - Get a bedframe that is proportional to your bedside tables. Fabric-backed headboards add a sense of luxury, warmth, and the added benefit of comfort. I like deep Navy ceilings in small spaces like this. It tricks the eye into thinking the space is much taller and spacious than it's reality. If you do this though, keep everything else simple. Paint walls white. Get white breezy curtains. Keep your bedspread. Add a neutral tan rug. Then have fun with accents! Get a few bright mustard or magenta pillows for a pop. I also have a small bedroom with white walls and ceiling. I painted the wall behind my bed a light bluish gray, it helps add a little depth to the room without making it seem dark. It would set off the white frame of your painting nicely, I have a mostly white print over my bed right now which helps keep the room bright. I used sheer white curtains over some white blackout honeycomb blinds over my window to keep the rest of the room looking simple. I agree with the suggestion for a headboard, I bought a low profile bed frame from Zinus with a padded headboard which is only about 3 inches deep. The headboard takes up very little space but is comfortable to lean against and makes the whole room appear much more cozy. The different colored wall, headboard and art give the room a focal point and my eye sees much less of my boring overhead light and awkwardly placed outlets. Others suggested clustering the pictures over the dressing table and I agree. Keep your curtain rod up where it is, hanging even my sheer curtains up that high added visual height to my room. To save as much horizontal space as I can I hang jewelry, rings, bracelets and necklaces, on pins in a cork board attached to the wall. I see you hang your necklaces already so this might be a good option for you. Can you mount the mirror over the dressing table to the wall to free up a few inches of tabletop? Your table is making me nostalgic, my parents used an old sewing machine table like that to hold the household telephone and I sat at it talking to friends for hours while working the foot pedal. The other thing I did that makes me ridiculously happy is get soft sided rope baskets to use as hampers and bulky sweater storage. When I inevitably bump into them they don't hurt. I'm adding to my answer above: I think some framed mirrors added in with the art over your dressing table would help add visual depth to your room from the perspective of someone sitting in the bed. They would reflect the wall and art over your bed so they wouldn't just be showing more white wall. Be sure to hang them high enough that you won't catch your own reflection and startle yourself from you own movement while reading in bed at night. (Ask me how I know this.) With this in mind, maybe my question about mounting the dressing table mirror to the wall is a bad idea since the angle of the mirror as it sits probably doesn't reflect directly at the bed. p.p.s. I'm very jealous of your two closets. 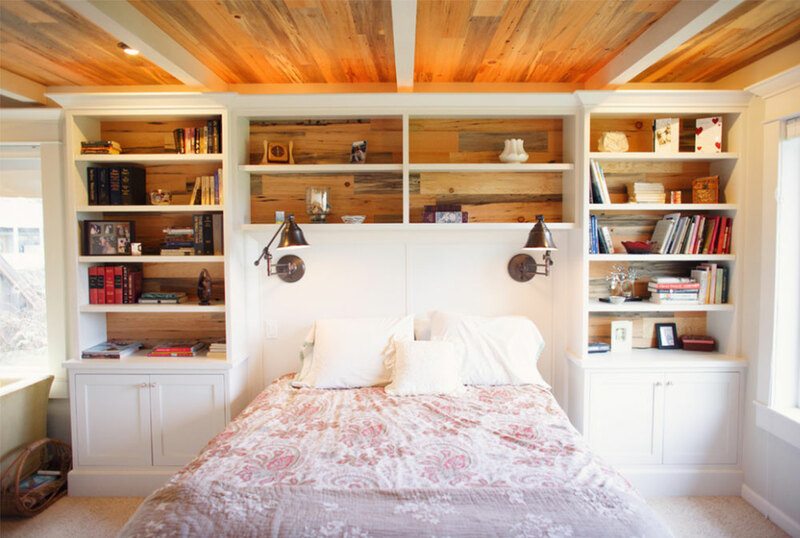 Adding as well to my own, for all of the...stuff...you have, you might also consider a storage headboard or putting bookcases above the bed, possibly reaching the nightstands. Actually, not many of the examples I can find have distinct nightstands, but if I did that in my room I would have the bridge across the top extend down the sides to maybe 18" above the nightstands (and they should match each other). Anyway, I don't think you have enough room to push your bed out from the wall too much, maybe 8", and any of these looks would probably blow up the idea of tying the rest of the room's style to the vanity.